Incredibly intact WW2 Japanese biplane. 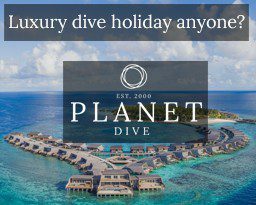 UK DIVERS WANTING a diving holiday often end up in the Egyptian Red Sea, the Maldives or maybe Bali – amazing destinations. But what if you seek adventure off the beaten track? In an age in which international travel has become almost too easy, it’s harder to find such places, but there are still a few spots where few tourists dare to tread. The Independent State of Papua New Guinea, or PNG, might just suit you. New Guinea, the world’s second-largest island, is split into a western half that forms the Indonesian provinces of Papua and West Papua, and an eastern half that is PNG. Further east lie New Britain, New Ireland and the Admiralty Islands which, with some smaller islands, form the Bismarck Archipelago, all of which sit just above Australia. Many of the wildlife documentaries about hidden tribes and amazing flora and fauna with which I grew up were filmed in PNG. 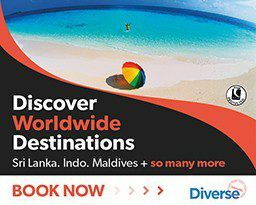 It is one of the world’s most culturally diverse countries but also among the least explored, culturally and geographically. It is known to have numerous groups of uncontacted peoples, and researchers believe there are as many undiscovered species of plants and animals in its interior. It also boasts more than 800 spoken languages, unparalleled in any other country. I flew to Singapore, then boarded an Air Niugini flight to PNG’s capital, Port Moresby. So far no more than a flight to anywhere else in Asia, but I was carrying on to the far eastern edge of New Britain, almost on the same longitude as Brisbane in Australia. After a long stopover I flew on to Rabaul for my first week of diving. It was only a 90-minute hop over dramatic mountains covered in thick jungle, broken by the occasional small village that would be completely cut off without its tiny airstrip. I could understand how some tribes remain hidden for years. RABAUL IS KNOWN as the town that was buried under a thick layer of ash after a volcanic eruption in 1994. It was also one of the main Japanese WW2 Pacific bases. The Japanese had captured the port from the Australians, considering it strategically valuable because of its proximity to the Caroline Islands, site of their naval base on Truk – a perfect staging post to invade the rest of New Guinea and, ultimately, Australia. Japanese forces quickly entrenched themselves in fortified tunnels and bunkers. Later in the war the Allies decided that a full-on attack to recover Rabaul was too risky, and instead carried out bombing raids that sank many ships. But by the end of the war there was still a sizeable Japanese garrison at Rabaul, and large quantities of equipment were subsequently abandoned. It took the Allies more than two years to repatriate the captured Japanese soldiers, and clean-up efforts continued into late 1950s. Ships, aircraft and weapons remain in the area, and locals told me that they were still finding old tunnels, equipment and munitions in the surrounding jungle. Some local museums seem to be little more than junkyards for such relics. AFTER A JOURNEY of almost 40 hours from the UK, my first day at Rapopo Plantation Resort was a bit of a blur, but I was welcomed with icy coconut water, staff serenading me and of course a flower garland. The resort lies on the southern outskirts of Rabaul. The area sees few tourists, so there are few places to stay. Rapopo seems to be one of the nicer spots but the few other tourists I met were either expats or on mini-breaks away from local mines or plantations, PNG’s main commerce. 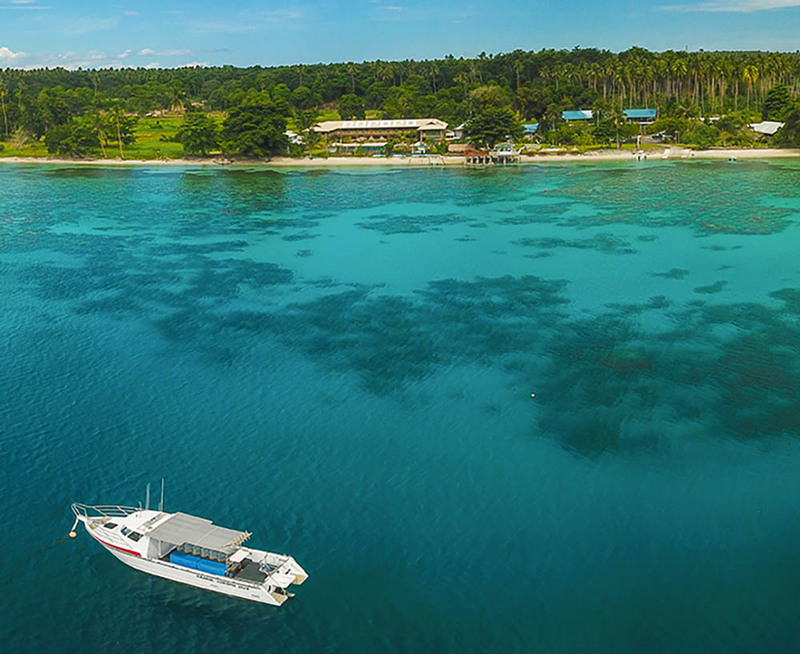 Gavin, owner of Rabaul Kokopo Dive Centre and formerly a naval officer in Australia, had spent the past two years operating what is one of only a couple of dive-centres in the area, and the only one PADI-affiliated. It operates three fast boats that can get you to many of the sites within 30 minutes. My first day’s diving was on a wall at a local island called Little Pigeon. The water was around 30°, so board-shorts and rash vest were the order of the day. The reef seemed healthy, with lots of coral encrusted with sponges and fans down as far as I could see. I was expecting slightly better vis, but wasn’t complaining. Colourful crinoids littered the lovely reefs, and I love to hunt among them for small critters. Almost at once I spotted a perfectly camouflaged shrimp hiding in the outstretched arms of its accommodating host. This pretty dive washed the cobwebs from my jet-lagged head. Pigeon Island is also home to a wreck – not a WW2 relic but a big trawler that sank in the mid-1980s. The current was strong and made diving it challenging. 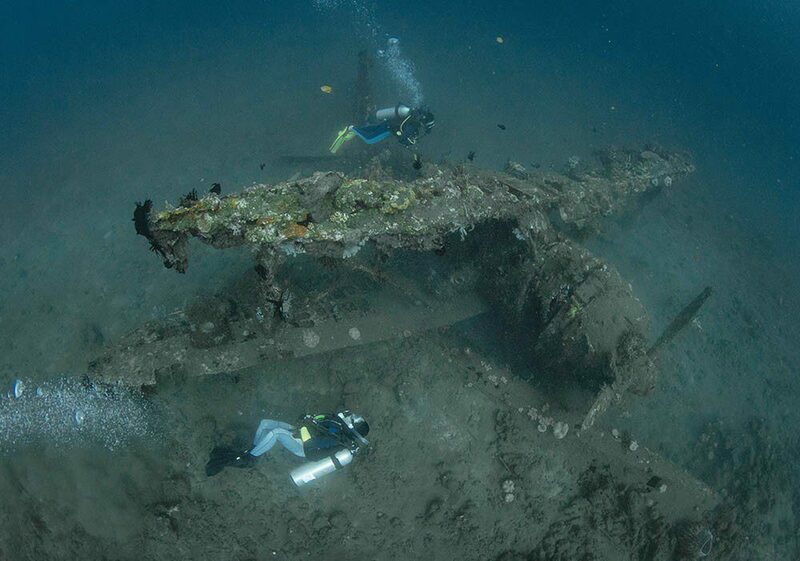 We planned to go a little further north towards Rabaul to dive the “Deep Zero”, one of the many aircraft wrecks in the area. 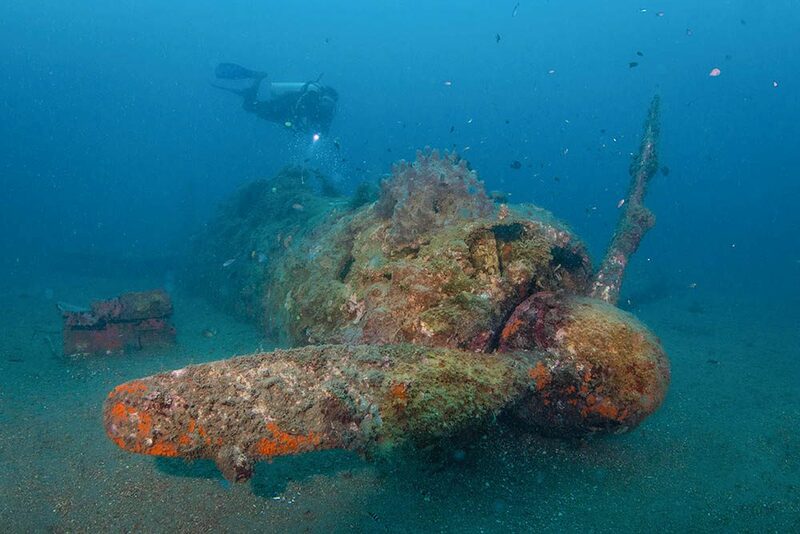 This Mitsubishi fighter, shot down in one of the many battles over Rabaul, lies just off the beach at around 35m. Wreck of the deep Japanese Zero. Many of the wrecks are owned by the closest landowner, so we first sought permission from an old man sitting on the beach. He told us that his father had seen the plane shot down in a dogfight with two Allied fighters more than 70 years ago. The pilot had made a last-minute controlled landing, so he knew exactly where it was. We paid him a small amount of money and carried on with our dive. The wreck was partially buried, but I could see how intact it was. The visibility wasn’t amazing and the sandy bottom didn’t improve things but the whole outline was visible. Coming in closer, details of the engine and cockpit including the seat and dials became clear. I looked into the cockpit and imagined the pilot fighting to control his plane as he tried to evade the hail of gunfire. This was the first time I had seen a plane under water and it was just as I had imagined it – a machine truly out of its element. 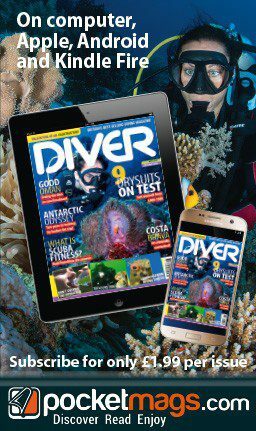 In remote New Britain the availability of dive-gear is limited so technical, extended-range or even nitrox diving isn’t usually an option. My no-decompression time was quickly up, and we ascended slowly up the reef and back to the beach. The old man was still there, and I showed him my images of his Zero. He was over the moon and told me he had never seen it before. 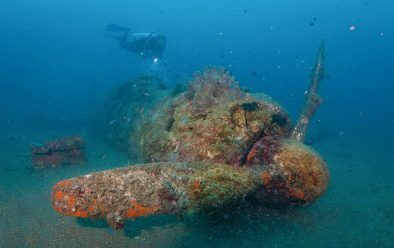 KEEN TO VISIT more wrecks, I learnt about a seagoing biplane that was dived only a couple of times a year but was very much intact. It lay a couple of hours’ sail from the resort, past the volcano that had inflicted so much damage on the town. It remains active, with smoke, soot and occasionally fire escaping from the cone. As we passed it, we saw what looked like rubbish floating at the surface. It turned out to be pumice stone ejected from the volcano, some pieces as large as my head. Sometimes the tide collects it into areas that stretch as far as the eye can see. I’ve become used to seeing plastics, but never stones floating at the sea’s surface. We had only a fisherman way in the distance for company at the remote dive-site. 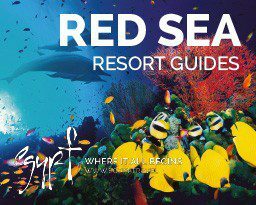 It was still early in the morning when we entered the water but the reef was full of colour and the sun’s rays made those pretty patterns on the coral that only us divers are lucky enough to see. With the unspoilt coral and fish oblivious to our presence, it felt as if no-one else had ever visited the site. 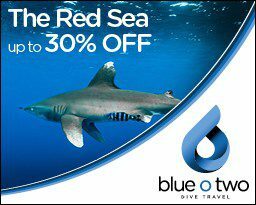 A pair of small reef sharks seemed indifferent. I wasn’t sure what I was expecting but it definitely wasn’t what I saw next. Resting bolt upright was what looked like a fully intact biplane. Although covered in coral and sponges, both wings were still in place, and even the delicate struts between them were all there. Only the giant float seemed to have broken off, though it still lay in position. People often refer to wrecks as underwater museums, but this truly was one. Some areas of the fuselage even retained original paintwork. If this plane had been anywhere else in the world it would have become an exhibit on land. We four lucky divers could take our time. On the way back, we stopped at a small bay at the foot of the volcano to dive George’s Wreck, a Japanese freighter that had once supplied the garrison. It was named after the man who had discovered it after talking to some of its crew in a bar in Australia in the 1960s. The reef dropped off into the depths very quickly, and only the forward sections of the ship were accessible, with the stern dropping beyond 60m. The bomb damage that sank this ship was clearly visible, with metal fragments splayed out from the violence of the explosion. Crinoids and giant barrel sponges covered the top of the wreck. The hold sat just below the damaged area, and the ship had either just delivered its cargo or been carrying perishable items, because the hold was empty. During the siege of Rabaul, very few ships had managed to offload, and the Japanese quickly realised that submarines were the only way to stay supplied. Hidden among the overgrown cliffs along this stretch of coast were many small tunnels in which submarines would offload by night. Although too far to visit, I was told of caves big enough for a sub to surface inside. Although much of it was buried in the volcanic eruption in the 1990s, the harbour contained many of the Japanese warships intended to be the icing on the cake for my few days in New Britain. Unfortunately Gavin’s GPS stopped working at this point, and the locations were not known precisely enough to take a punt on diving in and taking a look. WE DECIDED TO FOREGO the harbour and head south to two sites that Gavin knew had some unexploded ordnance and another fighter plane. On the way we stopped at another unnamed freighter, named the Sake Wreck after its cargo of bottles that can still be found in the area. Children playing on the beach a stone’s throw from the wreck were intrigued by the strangers invading their private playground. 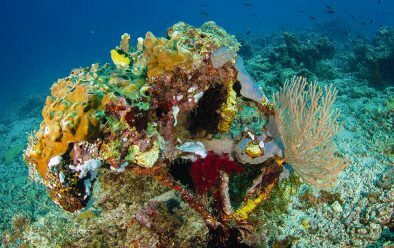 This wreck rested in only about 10m depth and had largely broken up, the bulk of it buried with only parts of the deck and rigging sticking out – but what remained had become a magnet for sea life. Attracted by my bubbles, a shoal of giant batfish greeted me as I entered the water and followed me for almost the entire dive, like puppies expecting treats. I was in the water with two other divers but they didn’t seem to want to make friends with them. Many other fish and critters make parts of this wreckage their home – giant crocodilefish and stonefish lay in wait for small fish. Colourful nudibranchs crawled over the sand, and silvery baitfish swirled hypnotically around one of the masts. We headed south, on the fringing reef that jutted out a long way before it dropped into the depths. Again, the vis wasn’t amazing, with strange fibrous particulate suspended in the water. Was this some by-product of the local coconut industry or from the volcano? No-one seemed to know. The reef was full of life. Silvertip sharks and jack patrolled below me, causing the reef fish to panic and seek cover all around me. Colourful crinoids stretched their arms to collect their food. Heavily overgrown tail-fin of one of the 500lb bombs. At about 20m on a rubble slope, Gavin was excited to show me what looked like a small outcrop of dead coral. I couldn’t work it out until it hit me that we were here to look for unexploded bombs, and this was the tail-fin of one of those 500-pounders that never hit its target. I was expecting that big classic-looking bomb sitting neatly on the sand, but these were almost completely buried in rubble and sand – six of them spaced out over several hundred metres. Had I come upon these in the UK, as divers do, an exclusion zone would have been set up and bomb disposal would have been sent in to make them safe, but in PNG they are just another tourist attraction. MY FINAL DIVE in New Britain came to an end as I was taken up on the reef-top to see yet another wrecked Zero. Although in worse condition than the others I had dived, what was left of the fuselage looked as if somebody had just polished it especially for my visit. Sitting at only about 4m, this would be a perfect snorkelling spot. 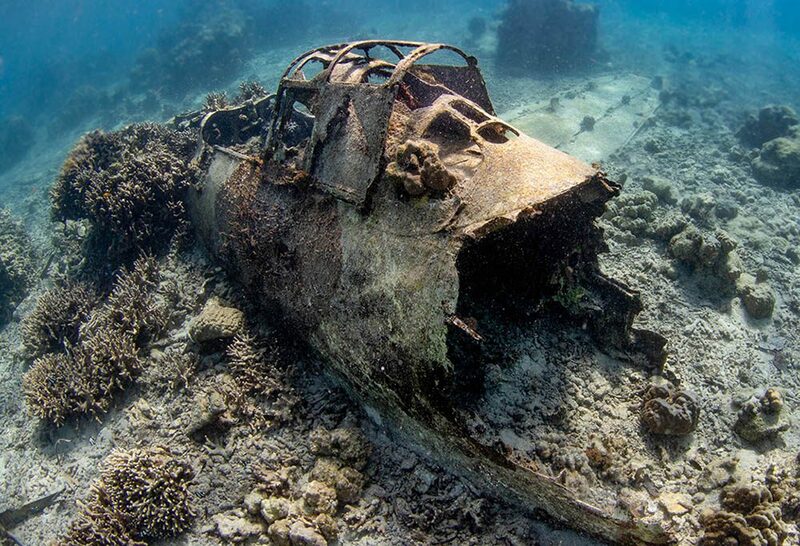 The propeller, engine and tail were missing and perhaps had been salvaged long ago but, exposed on this shallow reef since the war, I was impressed that even this little bit of the plane had survived. It was a lovely way to finish my week in Rabaul. I had missed out many of the sites I wanted to dive in the area, but my journey had not been wasted – it has opened my eyes to a part of history of which I knew little. Many of the wrecks have either been forgotten about or have still to be found. Gavin’s new boat arrived the day I was leaving, fitted out with sidescan sonar which he hopes to use to fully plot the seabed around Rabaul. As I write this, he has already discovered some new wrecks. Tourism here is still in its infancy, and if you want to go somewhere without all the bling and glitz that can make other locations seem a little too much, now is the time to go. GETTING THERE>Saeed flew via Singapore with BA but routes via the Philippines, Jakarta and Australia are possible. From Singapore he took Air Niugini to Port Moresby, then a short internal flight to Rabaul. Tourist visas are available on arrival. WHEN TO GO> Year-round. July to January are considered the best months, but beware the strong trade winds of the months of January and July. Water temperature is in the 29-31°C range. HEALTH> Anti-malarial medication is very important. At the time of Saeed’s visit the hyperbaric facility in Port Moresby was out of action so the closest chamber was in Australia. Good insurance is vital.